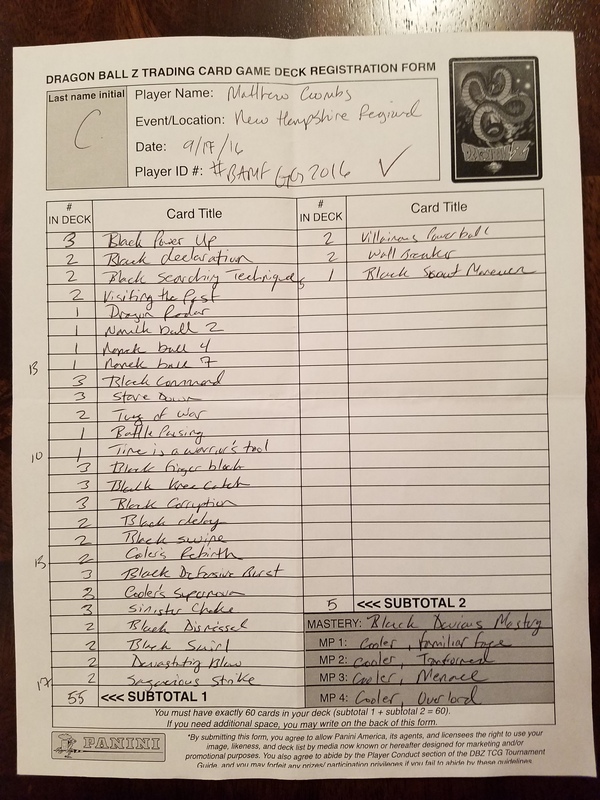 NH Recap and Earth DBs! 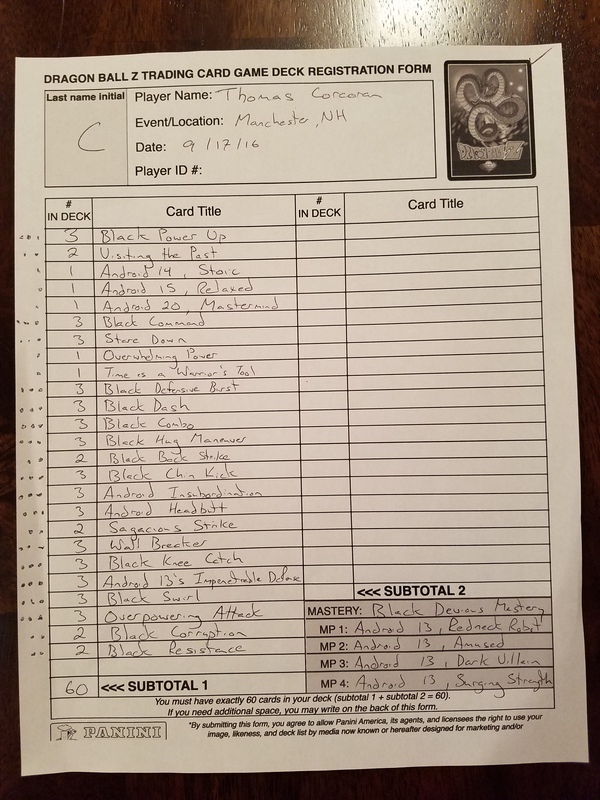 The New Hampshire Regional (hosted by Double Midnight Comics & Games) took place last weekend – with 99 players making it out to GraniteCon in in Manchester, NH! The event displayed Vengeance’s trademark diversity, with Saiyan, Black, Red, and Blue all seeing near equal representation. 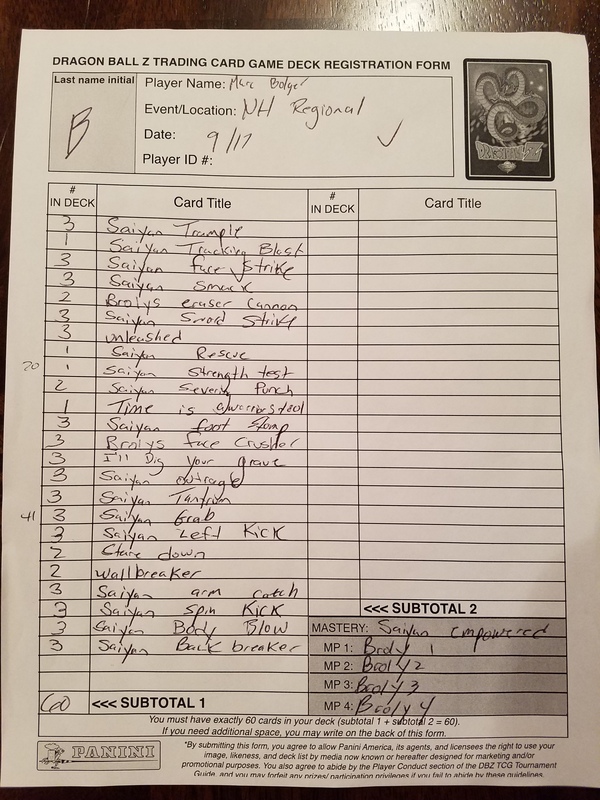 Namekian and Orange were less represented, but both were seen in Top Cut. DBZ Voice actor Dameon Clark was present, combining with the excellent prize support to add an extra level of prestige to the day! The cut to T16 featured nine different Main Personalities, with Tien, Roshi, and Raditz joining the Vengeance villains. However, the day belonged to Namekian Restored Gohan – a recent tournament darling that has been gaining ground with prominent players in the tournament scene. 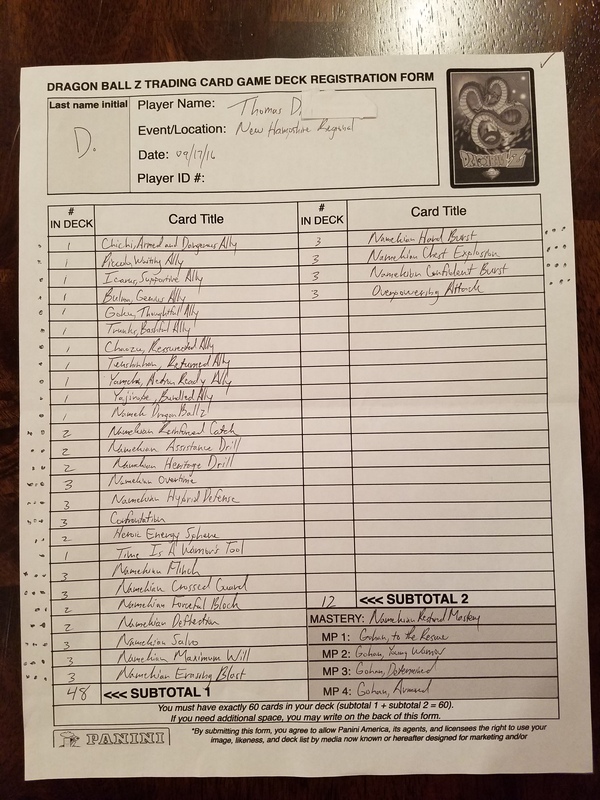 In the finals, Thomas D. (Namekian Restored Gohan) and his Ally beatdown deck took down Thomas Corcoran (Black Devious 13) – solidifying the continued rise of Allies in the current metagame! Congratulations to Thomas and Thomas, both added to the 2016 Qualified Player list. As the countdown to the World Championship continues, fewer and fewer slots remain! Of course, you can always qualify on Friday in the Last Chance Qualifier – details coming soon. Next up on the OP schedule: Colorado Regionals (pre-register here). The Super Elite rankings have been updated, with Matthew Coombs (6 points) moving into fourth place on the back of another Top 4 finish. Tim Sweeney has also solidified his position by joining the exclusive 4 point tier. Similar to Namek Dragon Ball 1, Earth Dragon Ball 1 adds +1 life card to your attacks – but the modifier also applies to your opponent. You’ll be able to “shut off” this effect by capturing the Dragon Ball and shuffling it back into its owner’s Life Deck. Contrasting with Namek Dragon Ball 2, the effect of Earth Dragon Ball 2 is not optional and may not target your own MP. In exchange, it differentiates itself with the ability to advance your opponent’s MP 1 level – offering solutions to specific MP Powers or wiping the drills of an opponent that is camped on Level 1. Earth Dragon Ball 3’s filtering effect adds +2 cards to your Life Deck, and the cards it will draw are a known commodity that can be advantageously arranged. On top of sculpting your hand, the effect also grants anger – allowing this Dragon Ball to find a place in nearly any archetype. Earth Dragon Ball 4 provides an answer to Allies, which can be slightly less useful than Namek Dragon Ball 4’s Drill/Setup removal. It is worth noting that this effect allows removal of your own Allies, which can enable some unique strategies. In addition to the utility, it also packs a punch in the form of direct deck destruction. Comparing favorably to Namek Dragon Ball 7, the mill effect of Earth Dragon Ball 4 is at its best when utilized multiple times per game. That #2 ball is almost enough is give up Namek 7’s power. Hope to see some more milling when 5-7 are previewed.